This is the first photograph in a new category, “Who’s That?”, a evolving compendium of found imagery from years back of vision scientists. The idea is that on occasion, one runs across imagery of vision scientists from other times and it makes for a compelling look back at history. At the 2007 ARVO, Don Fox helped set up a presentation on the early years of ARVO where he showed some images of John Dowling, George Wald, Brian Boycott and more while Bob Barlow, John Dowling and Harris Ripps spoke for almost two hours about the early history of ARVO and neuroscience research at the Marine Biology Lab at Woods Hole. The images that were shown were these people as young scientists in the lab or just talking with each other on grassy lawns. I was amazed by these photographs because at the time, they were snapshots that potentially meant relatively little except to those people in the images who might want a memento of their time together. However, in the context of history and the legacy of knowledge, these image have become priceless. They document the flow of information and scientific progress through history and interpersonal relationships and induce a sort of realization that comes to me again and again as I walk through life as to why photography is so important. These are moments in time that are captured and preserved in images of a time and place that will never come again. I would love for people and friends in vision science to forward the images they have and we’ll get them posted for all to see and to document the history of vision science. I have a few images myself, but I know that my friends and colleagues are sitting on treasure troves of imagery that we should be making available for the community and for the posterity of vision science. 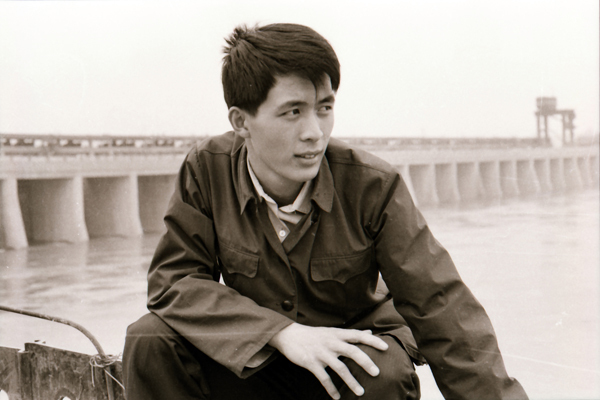 So, as to this image above: This photograph is of a perhaps 18 year old Ning Tian some time in 1981 near the Three Gorges Dam in China when he was a first? year medical student, long before he came to the US, spent time at SUNY, UCSF and Yale, ending up at the Moran Eye Center. I’ll save the career retrospective until much later in Nings tenure as a vision scientist, but I could not resist sharing this rather well done photograph from not that long ago, but temporally removed enough to make it interesting. Image credit: Ning Tian, M.D., Ph.D.